Good tour, it does look like a good escape. We now live in a place where tourists come to escape winter so it's been a while. When we lived in Boston with endless winter, I loved visiting the greenhouses at Lyman Estate. I hope my Aloe spinosissima would hurry up and bloom like this one! Definitely Agave gypsophilia, which I'd like to have. Beautiful! What a great nursery. I also made a quick escape to a local nursery yesterday. - Unidentified euphorbia just above Echeveria ‘Super Star’: Looks like Euphorbia millii to me (Crown of Thorns). 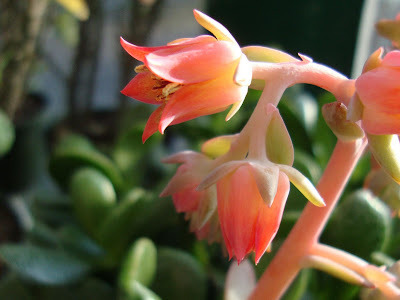 - Turquoise succulent with wavy leaves: Echeveria gibbiflora bybrid, probably Aquarius or Lady Aquarius. 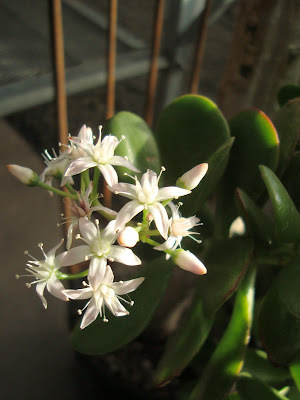 - Agave gypsophila: Yes, I agree. I'm clearly out of touch with PN's winter aspect. Better remedy that! That Marantha you show looks a lot like one we have in our house (a plant from my dear departed MIL's back porch.) I don't really have an "escape" location for winter days: my coping technique is to whine a lot. But I'm looking forward to a weekend in Pasadena this month. Let's hear it for warm environments-created or actual! Great looking nursery and fantastic selection of exotic plants to give you that plant fix at this time of the year. 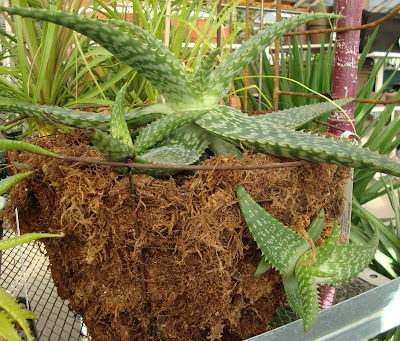 One new idea I've picked up from your photos is growing aloes in hanging basket, I thought it looked great! Although our lack of rain this winter worries me a bit in the long-term...it's been awesome for working our shed! Shirley, wow...that looks like someplace I could get lost in for hours! Good point about living somewhere that people come to escape, I hope that will be me someday! Alan, the Climatron!!! How come I had never heard of this before??? You made my day. Of course the action garden (and now the Climatron) are on my list to see someday but that word alone is priceless. I think our shade pavilion greenhouse will now be called the Climatron v2. Gerhard, thank you for the id's! MulchMaid, it's the Division St PDX Nursery, in case you couldn't tell. Stark street isn't quite as nice in the winter. Mark and Gaz, do you guys have to take your shoes off too? Yes, it's amazing how good many succulents look in a hanging container! scott, looking forward to a shed update soon! How exciting! You are so smart to have thought to visit Portland Nursery's greenhouse full of goodies blooming their fool-hearts out!! I, too, will visit soon! Love that Agave gypsophila. That is on my "plants I NEED list for sure". 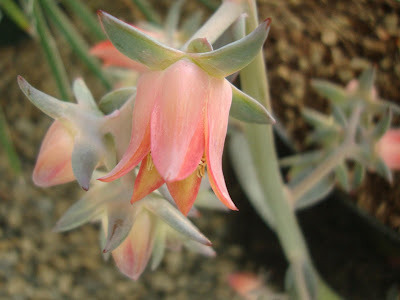 The wavy Echeveria is cool too. I saw some great ones in Hawaii. I would have thought it would be too wet and humid for them but they were some of the nicest I have seen. You are attracted to the most unusual plants....Under your unknown euphorbias statement, the first photo,pink bracts, is a crown of thorns. I have that one. Lauren, hope they are still blooming for you! Kaveh,your "plants I NEED" list must be getting pretty long! I didn't have an escape to place, but now I do. No need to escape winter here in Austin. We go elsewhere (mostly Colorado) to escape summer!